Reigniting the Ashfield Music Festival project for Chemistry Undergraduates: a Context and Problem Based Learning (CPBL) approach to teaching transferable skills. This project took the Ashfield Music Festival model developed by the Institute of Physics and reworked it to develop a Fireworks-based CPBL activity for use by second year Chemistry undergraduates. 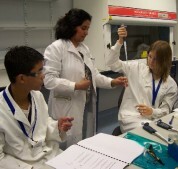 The students were tasked with running a simluated fireworks display, an activity that involved the development of key transferable skills such as communication, teamwork, leadership and commercial awareness in a discipline-specific context and that required some basic undergraduate chemistry knowledge. It was felt that opportunities to develop these skills can sometimes be lacking during STEM degree programmes but are highly prized by employers. The resources were developed with involvement from industry (Alchemy Fireworks and Skyburst the Firework Company) which allowed the effective alignment of skills needs of employers and the needs of the STEM graduates themselves. In addition, the use of PhD students as 'experts' during the CPBL activity had the benefit of improving their communication and employability skills. The project produced an activity pack containing worksheets, briefing papers and presentations, allowing the resource to be easily adopted by other HEIs. Develop a CPBL activity, inspired by the Ashfield Music Festival, through which Chemistry undergraduates are able to develop key transferable skills such as commercial awareness, communication and teamwork within a discipline-relevant context.